Sweet & Savory Spinach Salad. 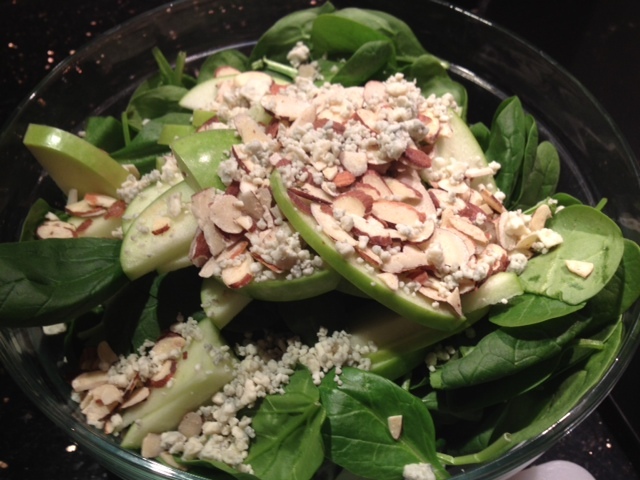 Spinach Salad With Green Apples, Gorgonzola, Honey Roasted Almonds & Balsamic Vinaigrette. This sweet and savory salad is absolutely delicious! The sweetness of the apples and the nuts are complimented nicely by the tangy Gorgonzola cheese and balsamic vinegar. The sweet and salty flavors combine perfectly to create a great everyday salad. Combine the spinach, Gorgonzola, apple slices and almonds together in a large mixing bowl and pour in the balsamic vinegar, olive oil and a dash of garlic salt and black pepper. Toss well to combine. ← Bacon Makes Everything Better.